Here is Felix in all his glory. 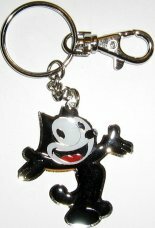 The Felix design is enamel on metal. Felix is 2" high x 1 7/8" wide. 1 left.